Pat Tillman, an NFL linebacker and an elite Army Ranger, was undeniably a tough guy. But he was also remarkably mushy when it came to his wife Marie, writing about her in his journal with a fervor and an eloquence that many women would say came close to poetry. On embarking on his three-year Ranger hitch, Tillman wrote, "Not only will the next 3 years make me a stronger person, mentally and physically, I know it will also free up my conscience to enjoy what I have. My hope is that I will feel satisfied with my accomplishment... enough to relax and just be. Be with Marie." Sitting in his barracks shortly after his enlistment in the Army, Tillman second-guessed his decision to leave his young wife behind while he served his country instead. "Sometimes I'm overwhelmed with an injection of intense sorrow that is difficult to control. An intense need to be close to Marie, surrounded by her touch, smell, sound, beauty and ease. It's as though one week of pain is condensed into 5-7 minutes... What have I done?" The pain of missing his wife was jubilantly relieved when the two rendezvoused at a motel during a leave after Tillman completed basic training. Marie was standing in front of the motel waiting for her husband. The delirious reunion was described by another soldier, Tulio Tourinho, who was with Tillman. "As soon as the cab stops, Pat leaps out the door. Marie runs up and jumps on him, knocking him off balance, and they both fall to the ground. They just lay there, kissing each other and staring at each other - him caressing her face, caressing her hair, telling how much he missed her, how much he loves her. They stayed on the ground like that for what seemed like ten minutes... It was an amazing moment. A demonstration of absolute love," Tourinho told Jon Krakauer, the author of "Where Men Win Glory." Watch the story tonight on "Nightline" at 11:35 p.m. ET and watch best-selling author Jon Krakauer's first live interview about his new book "Where Men Win Glory: The Odyssey of Pat Tillman" Monday on "Good Morning America." Tillman first met Marie Ugenti when he was 4-years-old and his kids soccer team played her team. While Tillman was the good looking jock, he didn't really have any dates until his senior year in high school. One of his first dates was Marie, and they were in love until his death 11 years later. After graduating from Leland High School, Tillman went to Arizona State University where he starred on the Sun Devils football team. Marie applied to ASU, but decided she would regret making a college decision "based on some boy." She enrolled instead at the University of California Santa Barbara. In the first days of college, "Pat missed Marie and his family so acutely during this period that he sometimes found himself reduced to tears," Krakauer wrote. Their bond endured through college and couple were married May 4, 2002. By then, Tillman was a professional football player with the Arizona Cardinals. The couple was planning on starting a family. Life looked good. They skiied in Tahoe, went ice climbing in Utah, visited Santa Fe and California, and were looking forward to a trip to Bora Bora. But 9/11 disrupted those plans. Tillman continued to play ball, his stock as a defensive hitman rising and teams began making multi-million dollar bids for his services. But Tillman was being pulled in another direction as he felt he should do his part and join the army. Tillman and Marie discussed his reasoning for months before he made up his mind. "It wasn't like 9/11 happened and Pat immediately said, 'I'm joining the Army,'" Marie told Krakauer. "He did a lot of research first. He weighed all the pros and cons. What was it going to be like for him? What was it going to be like for me? He considered things from every possible angle." One angle was children. When Tillman finally made up his mind to enlist, Marie decided to postpone having children because she didn't want to be raising a child alone while her husband was deployed to Iraq or Afghanistan. He made up his mind on April 8, 2002 and wrote about it that night. Towards the end of his musings, Tillman wrote, "I'm not sure where this new direction will take my life though I am positive it will include its share of sacrifice and difficulty, most of which falling squarely on Marie's shoulder." The separation of basic training and later war was wrenching for both of them. Tillman agonized over missing Marie in his journal. "As always Marie is always on my mind," he wrote while at Fort Benning, Ga. "I have been unable to speak with her... since we've been here and I miss the sound of her voice... Often it bothers me that I am not by her side... I love her to death and know that eventually this will be good for us. Hopefully, she will one day see it that way." Since his death, Marie has moved to California and is now chairman of the board of the Pat Tillman Foundation. The foundation endowed a two semester curriculum at ASU called the "Leadership Through Action Program." It accepts 15 to 20 Tillman Scholars each year. And there are plans to expand it to other institutions. Marie told Krakauer that she could not fight the military like her mother-in-law has over the details of her husband's death and the subsequent cover-up. "I didn't feel like I could focus on the investigation and maintain my sanity. I would read through the documents, picture Pat being shot, and it haunted me. I couldn't detach this person that I loved from the horrific details in the documents," she said. 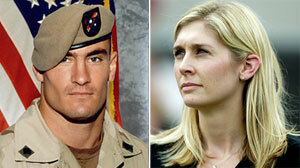 When asked if she was ever angry at Tillman for enlisting, Marie told Krakauer, "I was never mad at him for that. You love someone for who they are; I can't really be angry with him for enlisting because needing to do that was part of who he was." She added later that her husband's death "left a hole in my life that's huge." "The sadness will run its course," she says. "But it's never going to go away."